Where do you live? I live in Howard City, Michigan. It’s a small town about 30 miles north of Grand Rapids. How long have you lived there? We have been here 22 years. Are you married? I’m married to Ted. We’ll celebrate our 28th wedding anniversary in May. Kids? We have 6 kids (ranging from ages 26 down to 9), a “daughter-in-love”, and 2 beautiful grand-daughters. Full time job? We recently sold our Aerial Crop Spraying business, for which I was the office manager. We will begin managing a Spray Service for another company in Kansas this spring, which is in operation every May through October. I also homeschool our youngest son. Who is your favorite author and book? Outside of God’s Word, I’d have to say A Voice in the Wind (Mark of the Lion Series) by Francine Rivers. What is your preferred genre? This fluctuates. When reading, I get on certain kicks for a time. Right now, I’m enjoying the “classics”. I’m reading (or listening to, rather) The Circular Staircase, by Mary Roberts Rinehart. When it comes to writing, I identify with the Christian Fiction genre, but I’m not tied down within this genre, either. I’ve written mid-grade stories, but my project now is an allegory for adults. I’d also like to try my hand at mystery, thriller, and romance in the future. How did you start this journey to become a writer? I remember writing stories all the way back to when I was in first grade! I think the love of weaving a tale and the joy and satisfaction it brings was created in my DNA, it’s part of who I am. But, I think I really knew that I wanted to be an author when I won a Young Author’s contest for my school when I was in 5th It was the first time the thought entered my mind that I could learn to do this well and do it for a living. What have you written so far? 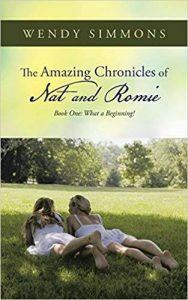 I have a self-published “tween” book that is the first in a series called, “The Amazing Chronicles of Nat and Romie”. Tell us about your current book. I’m writing an allegory of the life of the Bride of Christ: Betrothed before birth to the King, a young girl embarks on a journey to the place He has promised to come for her. Along the way she will face sorcery, persecution, and even death as she is transformed into the Bride longing for the return of her Beloved. What is the inspiration for your current book? As part of His Church, I long for Christ’s return. I have a desire to share the reasons why I have this longing. Who was your favorite character to write and why? My MC, Carita is my favorite because she is I can identify with all her flaws and yet have hope. There is change going on. If it’s happening in her, it can happen in me, too. What sets your book apart? Hopefully excellent writing will set it apart, right? (wink) I haven’t found a book yet that tackles this topic quite this way. I hope it will bring clear perspective on Christ’s love and sacrifice for us and how really knowing Him helps us fall deeper in love with Him. The stories told about the mutant leader didn’t compare to the monster she beheld now. His hunchbacked body covered with scraggly black fur twisted together with human characteristics repulsed her. But, it was the beast’s eyes that terrified her. A ragged red scar stretched from the outer corner of one eye to the other, its line etching across the gray-white pupils. They saw nothing, but they emanated a hatred like Carita never knew existed. What was the most difficult part to write? Again, it’s early in the project, but I foresee my biggest struggle will be handling the personification of Deity. This is serious ground that I want to travel carefully and do well. What was your favorite book to write? This one, so far. How do you write? Do you have a set time or place? How many hours a day? I have a crazy schedule and household with virtually no quiet place to write. I’m finding that very early morning is my most productive time. I’m averaging 2 hours per day, three or four days a week, with an added afternoon at the library alone. The library visit gives me a 5 hour uninterrupted stretch of writing and editing. Why did you want to be a writer? I want to share stories that can positively affect people’s lives. Hopefully my work will give hope and encouragement, as well as entertain, and they will come out from it feeling they’ve gained. How do you get your ideas? Real life, mine and what I read about. I’ll hear of an event and find myself wondering and dreaming about the people and circumstances that led up to it. What do you have planned next? I’ve read of another account in scripture where two families’ lives are intertwined in a miraculous way. I’d like to weave a fictional tale of their back-stories. I would also like to re-write my self-published book and continue the series. What advice would you give new writers? Never stop learning, don’t be afraid to ask questions. And then, do it. Get in that chair every day and write!